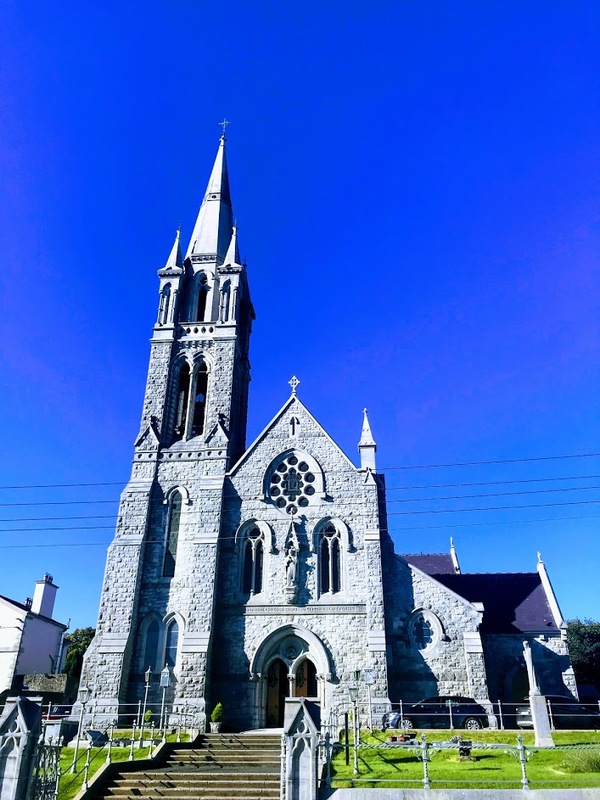 With the fading grandeur of Sanders Park or Charleville Park in danger of crumbling and its site boarded up and fenced off, the dominant architectural feature in the north Co Cork town is Holy Cross Church, which was built at the north end of Charleville’s Main Street in 1898-1902. 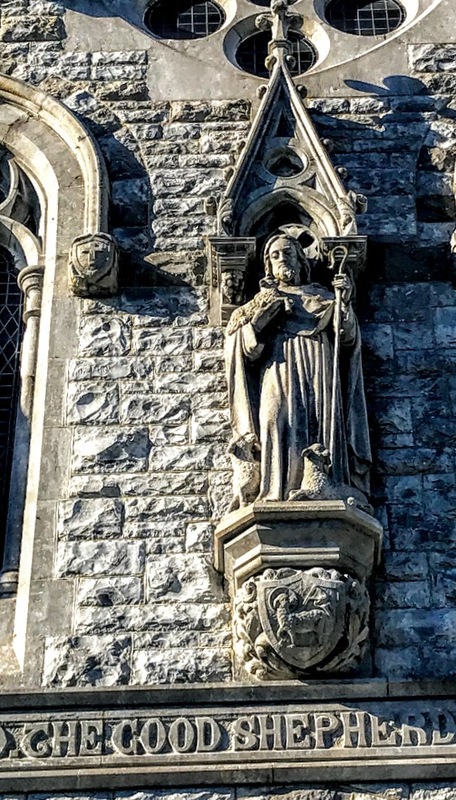 This Gothic Revival church was designed by the architect Maurice Alphonsus Hennessy, who worked mainly in Co Limerick and Co Cork. It stands on a prominent, elevated site at the junction of the Limerick-Cork road and presents a strong presence in the town. 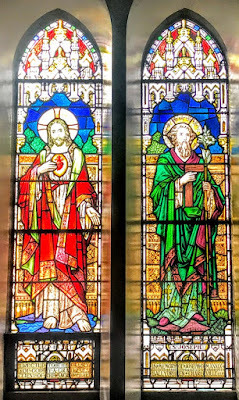 Holy Cross Church is close to the parochial house, the Convent of Mercy and the first school run by the Mercy Sisters, and with the priests’ graveyard in front of the church they form a coherent church cluster or campus sometimes referred to as a ‘chapel village.’ The ornate piers and folding gates in front of the church continue the Gothic theme of this site. Until Holy Cross Church opened in 1902, the Catholic people of Charleville were served by the small chapel built in Chapel Street off the Main Street in 1812, 17 years before Catholic Emancipation in 1829. In 1896, the new parish priest of Charleville, the Very Revd Patrick O’Callaghan, and his parishioners commissioned a new church on an elevated site at the Limerick end of the Main Street. Early Ordnance Survey maps indicate the Zion Chapel, a Congregationalist church, stood on this site in the early 19th century. 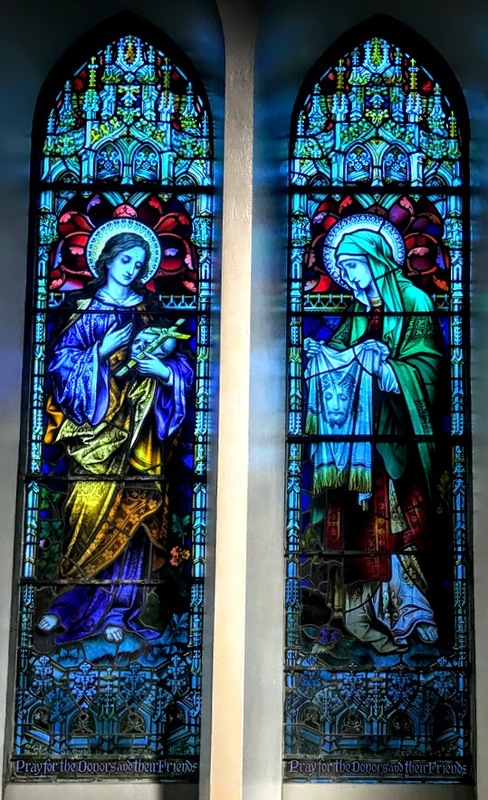 Funds for building a new church were raised at home and abroad through the Irish emigrant network. 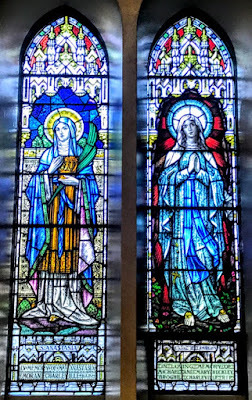 Charleville residents who worked to raise funds and to support the project included Margaret and Isabella Croke, key members of the Sisters of Mercy, and Thomas Croke, later Archbishop of Cashel, as well as prominent Catholic families including the Binchy, the Clanchy and the Daly families. Professor Daniel A Binchy (1899–1989) from Charleville was the first Irish Minister to Germany from 1929 to 1932, and an uncle of the author and Irish Times writer Maeve Binchy. With Osborn Bergin and RI Best, he is famously the subject of a comic verses by Flann O’Brien. The building committee sought ‘Architects of character and respectability’ to design a new church. Father O’Callaghan had been a curate in Cobh, and his first choice was AWN Pugin’s son-in-law, George Coppinger Ashlin (1837-1921), designer of many Gothic Revival churches throughout Ireland. However, Ashlin declined the invitation, and instead the commission went to Maurice Alphonsus Hennessy (1848/1849-1909), the architect of several churches in Co Limerick and Co Cork. Hennessy was born in Cork in 1848 or 1849 and died in Cork in 1909, but for much of his working life he lived in Limerick. He was working from 10 Glentworth Street, Limerick, from 1873 or before until 1887, and from 1888 or 1889 at 62 George’s Street (now O’Connell Street), Limerick. He published a pamphlet in 1875 that advocated the appointment of diocesan architects in the Roman Catholic Church, and he made this argument again in the Irish Builder. Maurice Hennessy worked alongside his brother, S Hennessy, from 1878 or earlier, with offices in Cork and Limerick. 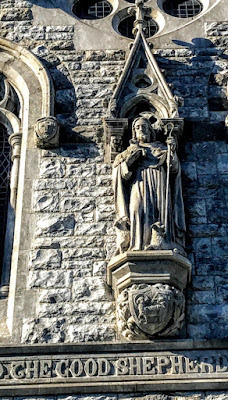 In 1879, the Hennessy brothers collaborated on the design of a new tower and spire for Saint John’s Cathedral, Limerick. Maurice Hennessy was appointed general engineer to the Limerick Union in January 1879, and later became engineer and architect to the Sanitary Board. He was invited to prepare plans in 1889 for new schools in connection with the Limerick Athenaeum, although there is no mention of the schools he designed being built. 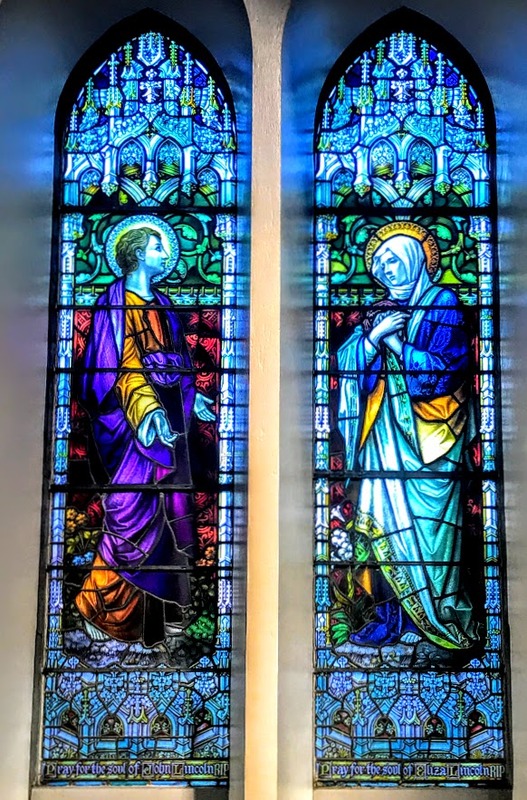 His works include Saint Saviour’s Dominican Church in Baker Place, Limerick, houses on O’Connell Avenue, Limerick, a number of Roman Catholic parish churches and presbyteries in Co Limerick and Co Cork, and works on Saint John’s Cathedral, Limerick. An inscription in a much later church at Timoleague, Co Cork, unfinished when Maurice Hennessy died in 1909, says it was designed by the Hennessy brothers. 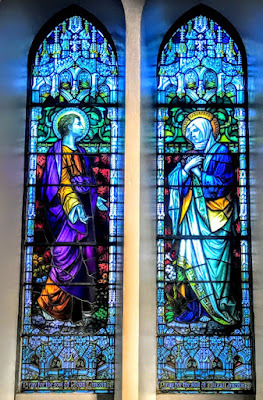 The undated chapel at Mount Saint Laurence cemetery, Limerick, is also said to be their work. 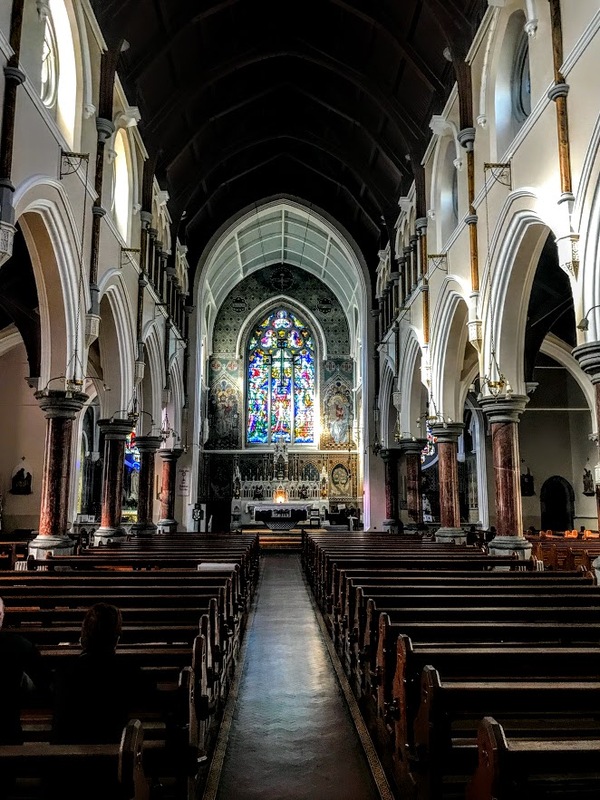 By 1896, the year he received the commission to design Holy Cross Church, Charleville, Maurice Hennessy was back in Cork and working from Trinity Chambers at 60 South Mall. He remained in Cork for the rest of his life, living at Dunkereen, Ballymurphy. He was appointed consulting engineer to Bandon rural district council in 1902 and worked from 74 South Mall, Cork, until he died in 1909. 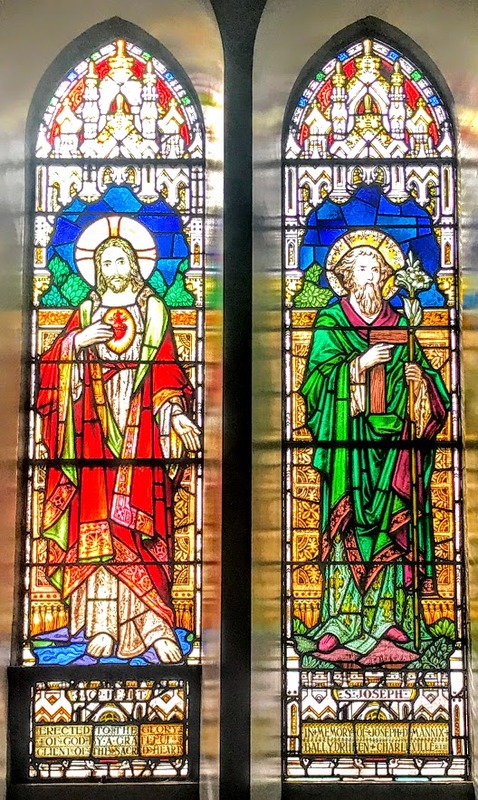 In his design for Holy Cross Church in Charleville, Hennessy developed the Gothic Revival style made popular in Ireland by AWN Pugin (1812-1852) and JJ McCarthy (1818-1882). 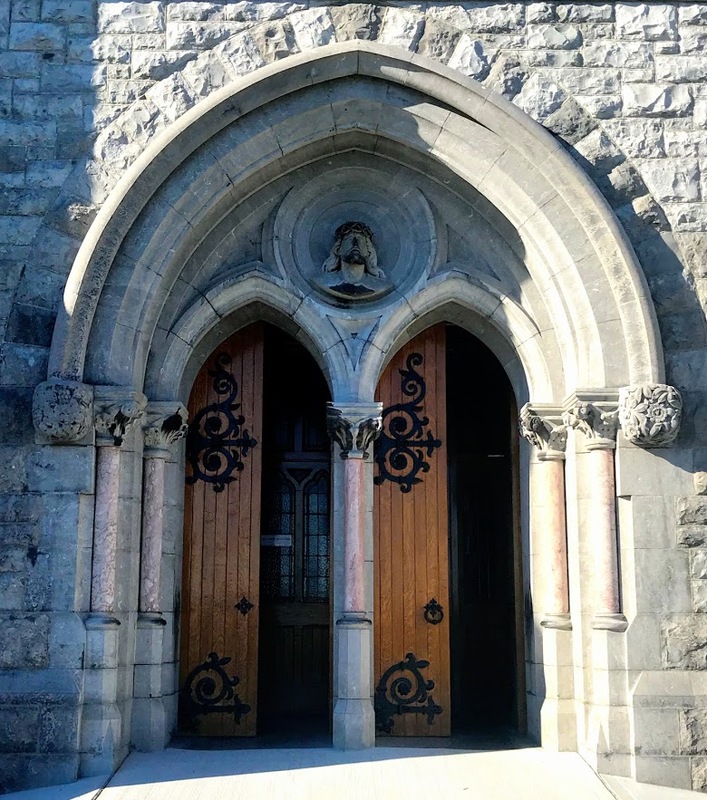 Hennessy’s plan was to accommodate a congregation of up to 1,000 people, and the church was built by the Fermoy-based contractor Denis Creedon. Holy Cross Church is oriented west-east rather than east-west, so that the liturgical east is at the west end of the church, allowing the entrance to face the Main Street. The church has a four-bay nave with a lean-to porch at the front, a four-stage tower, a single-bay, single-storey mortuary chapel, transepts and chancel at the west end, a three-bay, single-storey over basement sacristy. There are carved limestone eaves brackets, copings and cross finials, a cut limestone chimneystack, copings and cross finials, decorative pinnacles, rock-faced rusticated limestone masonry walls with plinth course, string courses, and buttresses at the corners. 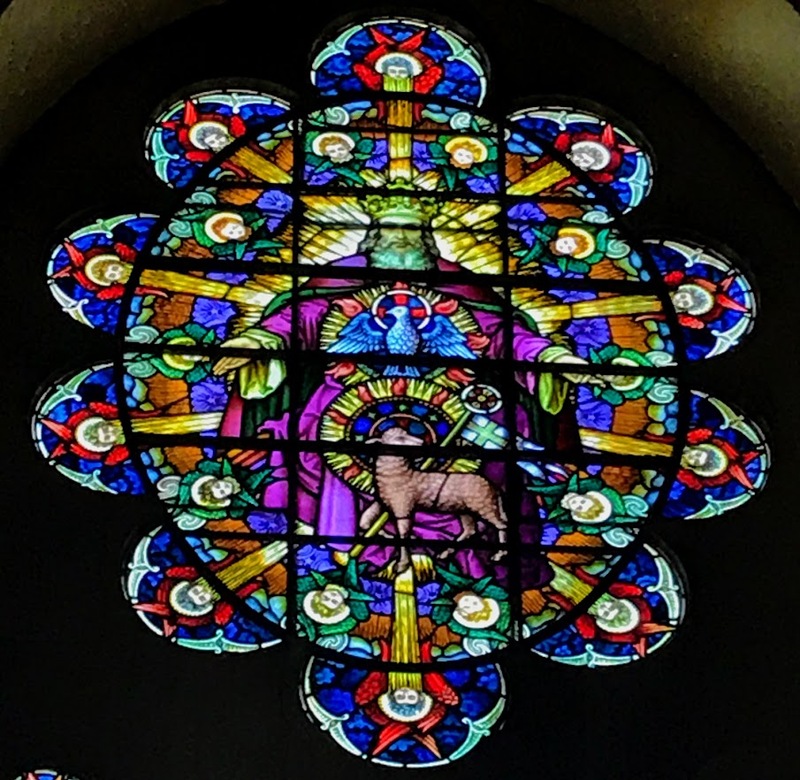 The front gable also has an interesting rose window or Vesccia window, best seen from inside the church. 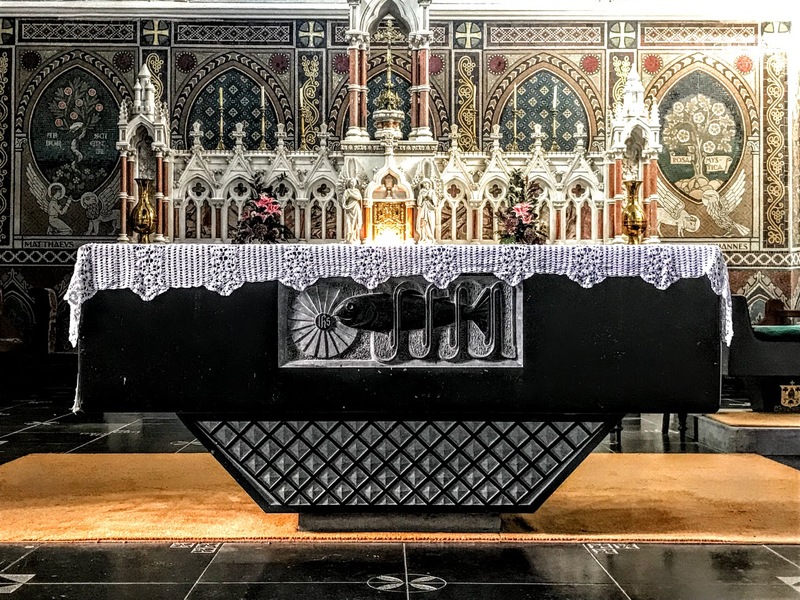 It is oval in shape, a style seen in many English churches and cathedrals, including York Minster and Lincoln Cathedral, but rarely seen in Ireland. 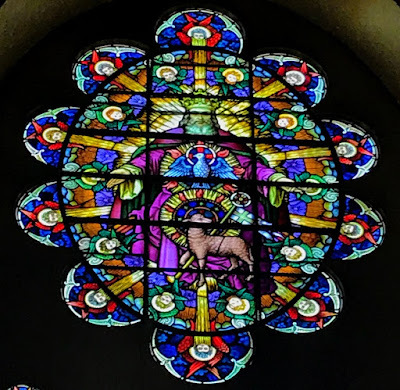 The ‘Vesccia’ design is also seen in the upper transept stained glass windows. Inside, the length of the nave and chancel is 136 ft, the height form the floor to the apex of the nave is 60 and the width of the church across the transepts and nave is 80 ft. The highly decorated interior reflects the Gothic Revival style of the exterior. 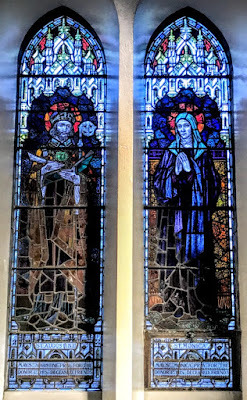 The details include ornate tiling on the floor, elaborate carpentry in the timber-braced scissors-truss roof, mosaics in the chancel by Ludwig Oppenheimer, an original High Altar by John Earley and stained-glass windows from the workshops of John Hardman of Birmingham, Meyer of Munich, and the Harry Clarke studios. The arcade of finely carved marble columns adds to the richness and colour to the interior. The side aisles have double lancet stained-glass windows, and clerestorey has cinquefoil windows. 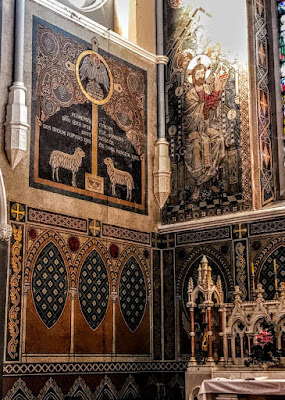 The marble mosaic decorations in the chancel, in the Lady Chapel and the Sacred Heart Chapel were designed by Eric Newton in 1918-1921 and installed by Ludwig Oppenheimer of Old Trafford, and cost £1,500 at the time. The steel cross in the chancel, decorated with the instruments of the Passion and hanging from the ceiling, is the work of Dom Henry O’Shea OSB of Glenstal Abbey, Co Limerick. 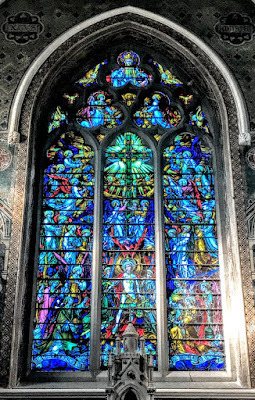 The ‘East Window’ in the chancel is the largest and most handsome of all the windows in the church. It depicts the Exaltation of the Holy Cross, and was the gift of the Men’s Confraternity in 1900. 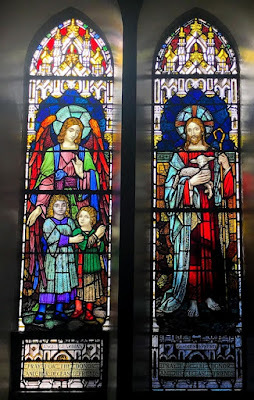 There are differing accounts that the window is the work of John Hardman and Company, the Birmingham studios that were founded in 1838 and that worked closely with Pugin, and by the studio of Meyer and Company in Munich. 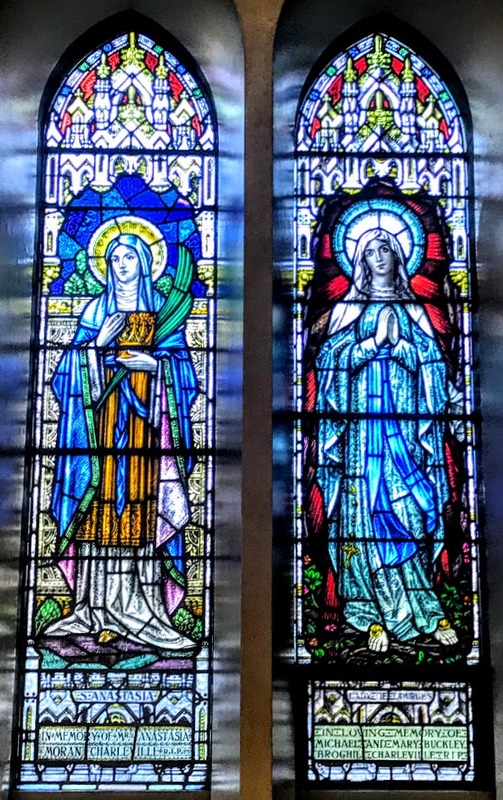 The other stained-glass windows in the church work include 12 windows from Joshua Clarke and Sons of Dublin, established in 1886. 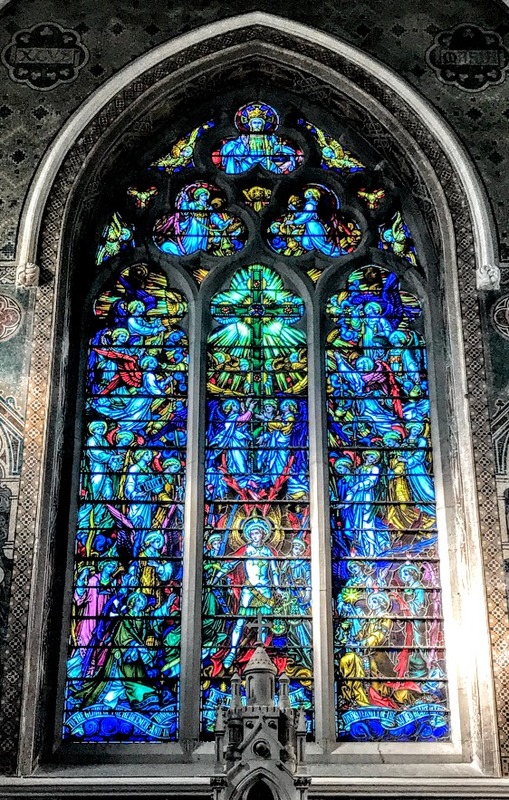 The project was overseen by Harry Clarke (1889-1931), and the windows were installed in 1919-1922. 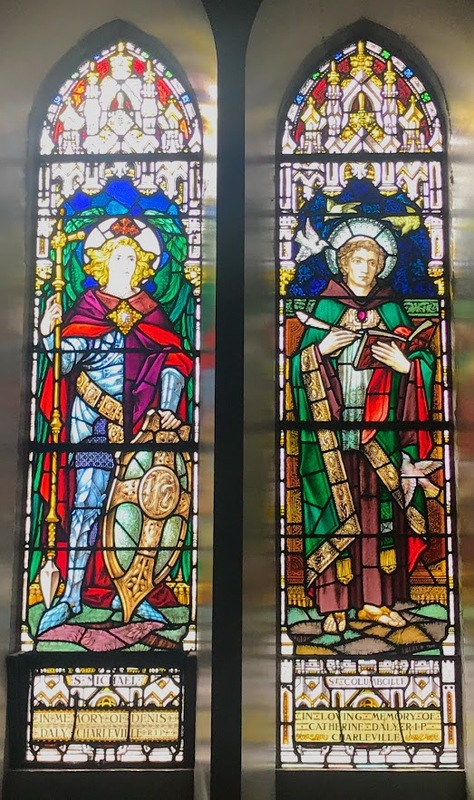 Local and global donors are named in the window dedications, including the Mannix, Daly, Cagney, Moran, Buckley, Binchy, and Lincoln families. 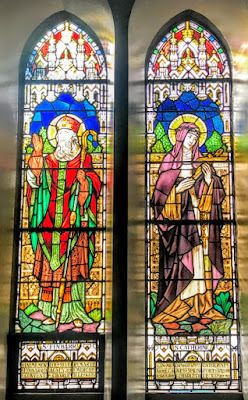 Saint Finbarr of Cork and Saint Catherine of Siena. 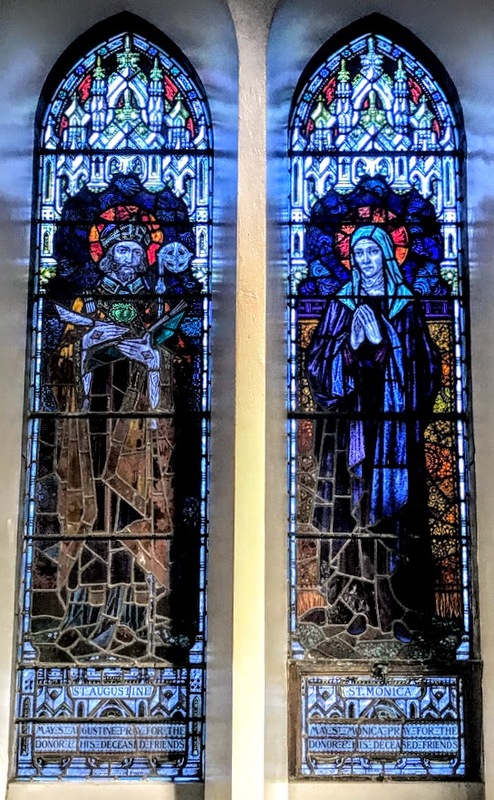 Saint Monica and Saint Augustine. 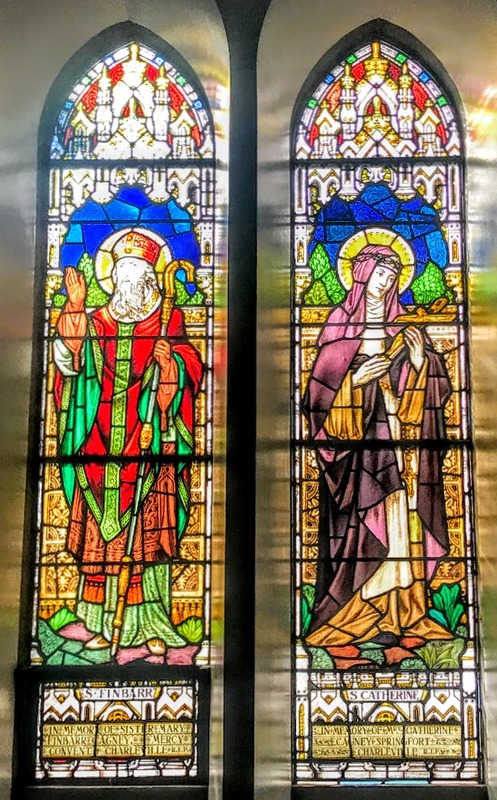 Saint John the Evangelist and Saint Elizabeth. The ornate timber gallery has quatrefoil motifs over the entrance at the end of the nave. The new church was consecrated and opened on 4 May 1902 by Robert Browne, Bishop of Cloyne, who was born in Charleville. The elaborate, tall tower with a spire and belfry, reaching a height of 150 ft, was not completed until 1910. The mortuary chapel was added in 1918 and the label stops to the doorway are carved with the initials RIP. 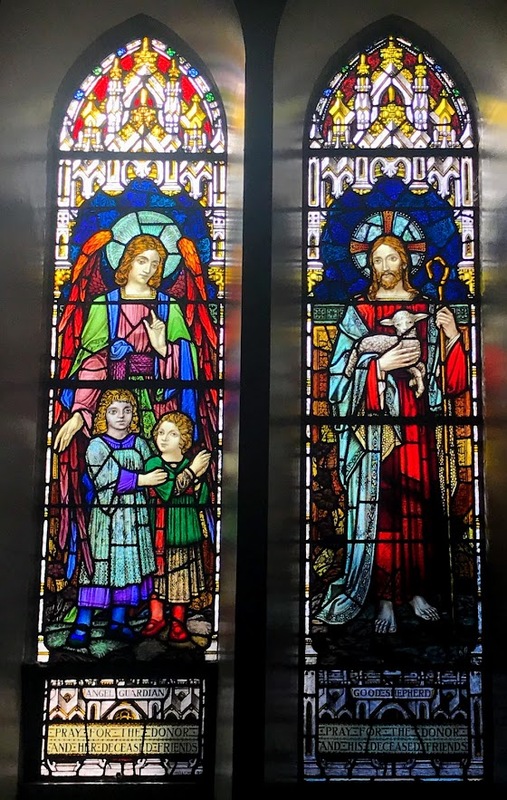 It was added to the church in memory of Father Patrick O’Callaghan, Parish Priest of Charleville (1895-1918), who had commissioned the church and who died that year. Since 1989, this chapel has been used for private prayer as the Adoration Chapel. Later work in the church includes the organ base designed by Ashlin and Coleman. The organ has a total of 1,421 pipes. 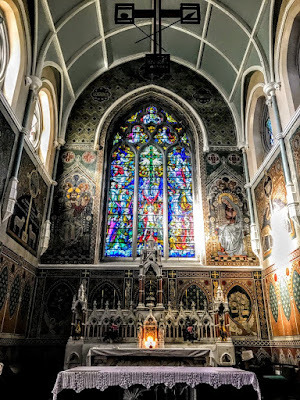 The chancel area was redesigned and enlarged in 1986 by the architect PL McSweeney of Cork and the sculptor Michael Sheedy of Midleton, Co Cork. The Altar at the front of the chancel is formed of two solid blocks of masonry, engraved with images of the loaves and fish. The paving on the chancel floor and the chair are made from limestone, and the original High Altar can still be seen. The church and tower, with their unifying Gothic theme, continue to provide the town of Charleville with a spiritual and architectural focus. 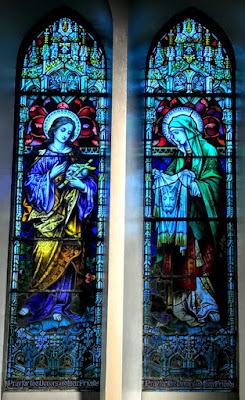 Sunday Masses: 7.30 p.m. Saturday (Vigil Mass); 10 a.m., 12 noon and 7 p.m.